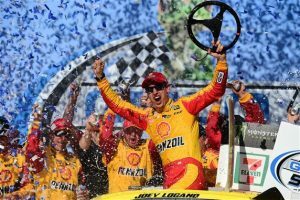 TALLADEGA, Ala. – Joey Logano led a Ford feast on Sunday at Talladega Superspeedway, beating Kurt Busch to the checkered flag by .127 seconds to win the GEICO 500, the 10th Monster Energy NASCAR Cup Series race of the season. Notes: Byron led 14 laps in his first Monster Energy NASCAR Cup Series start at Talladega… Menard picked up his first stage victory, holding off Logano on Lap 110… Seventh-place finisher Alex Bowman led 26 laps and Keselowski 21… NASCAR Camping World Truck Series veteran Timothy Peters finished 23rd in his Cup debut… Reigning series champion Martin Truex Jr. suffered damage in a Lap 72 wreck and finished 26th. The cars of Erik Jones, Trevor Bayne and Kyle Larson were eliminated in the same incident.